Browse our collection of 1 Pop Culture Blankets and more. Designed and printed in the USA. 100% Satisfaction Guaranteed. About this Design This sharpshooter's ready for the 21st century now. Annie Oakley's traded her Wild West fashion for some biker chick gear, and she's got a whole arsenal of revolvers, machine guns, tanks and nuclear warheads to defend her country. Yeehaw! This sharpshooter's ready for the 21st century now. 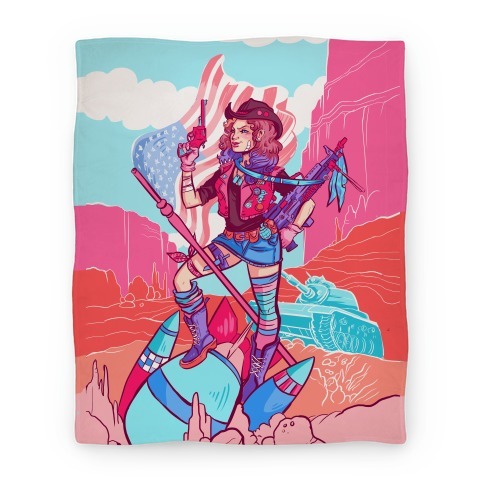 Annie Oakley's traded her Wild West fashion for some biker chick gear, and she's got a whole arsenal of revolvers, machine guns, tanks and nuclear warheads to defend her country. Yeehaw!